Oh, this skirt. It started off so, so well. I was so excited to have a skirt to post to the Monthly Stitch Collective. And on time! This month’s theme was “New Year, New Skill”. 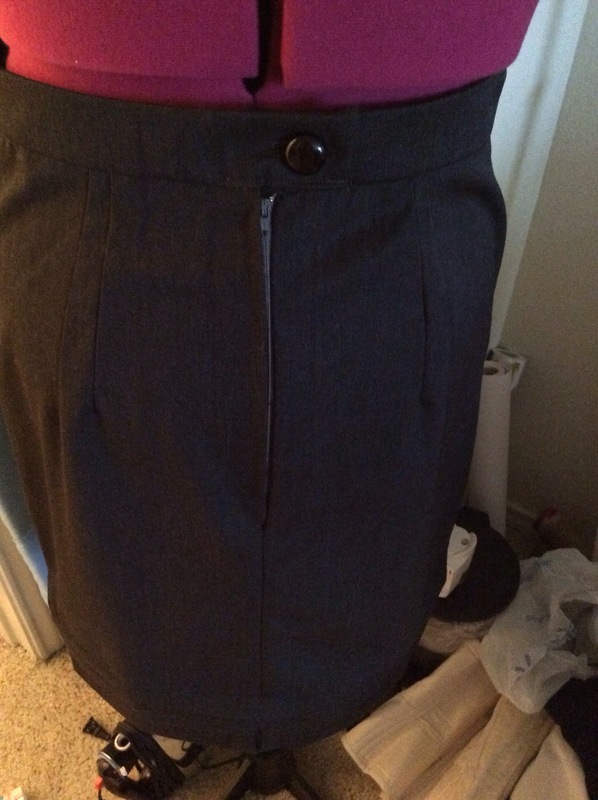 My primary new skill with this skirt was to install a lapped zipper, which turned out okay. My problem was that when everything was said and done, I nicked a small hole in the center front of the skirt. Ugh. More on that after the pics. So… pretty sure I just figured out what I’m wearing to the Nerdlesque show at All-Con. Fabric: 1 1/8 yds of grey Italian grey wool suiting blend. It’s the same stuff as my Cambie work dress. Alterations: A few fit alterations and added horizontal pleats, inspired by Colette’s Pastille dress. Time: I honestly have no clue. Those pleats took freaking forever. Make it again? Yes, though I think I’ll go for a bold color. I’d love to try some of the alterations mentioned in the book, like lining it and adding boning to the waistband. Favorite parts: Overall fit, the waistband, and the pleats. 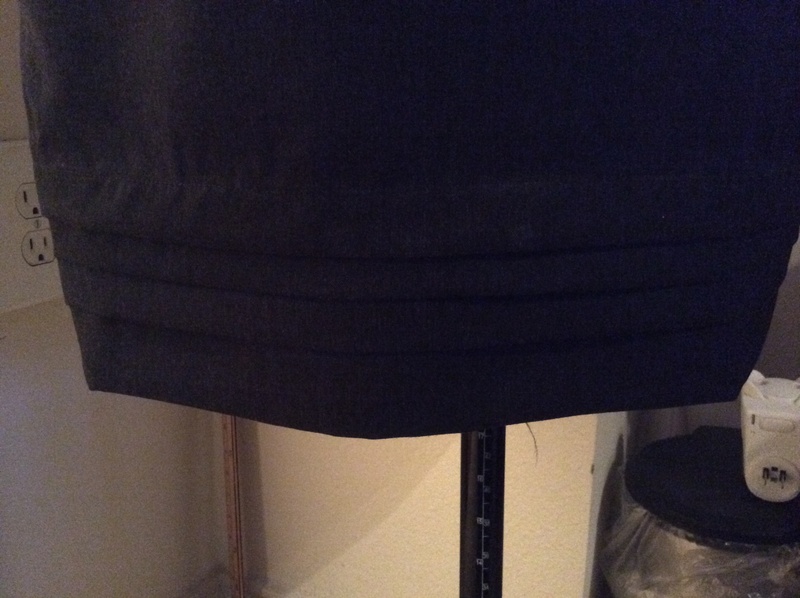 After I had a minor freak out upon discovering the nicked spot on the front of the skirt, I decided to iron some interfacing over the hole and add horizontal pleats (inspired by Colette’s Pastille dress). By the way, thank you everyone for the wonderful ideas! I thought that adding the pleats would be the easiest and most time efficient options. Ha! Oops. The Pastille dress is actually on my to-make list, so I’ll keep that in mind when I do get around to making it. I like the overall look of the pleats (even if they took a million years), but it brought the skirt up a little shorter than I would have liked. Still work appropriate, but I don’t think the super high waistband really works as well. More than likely I’ll wear tops untucked with this skirt. Close up of the pleats. My apartment has terrible overhead lighting. Sorry. The back also looks a little odd. The Pastille dress has an invisible zipper and no slit as far as I can tell. I’m decided to just tack it down and move on with life. I’ll have to see how much it bugs me when I wear it to work. On to the next challenge: trousers! A fellow wig wearer !! And so well too. Such a cool outfit, looks really sharp. And corsetery? I’m in awe. And you’ve reminded me about the charms of Colette’s pastille all over again!! Thank you. Thanks! I loved your Renfrew wig awards post 🙂 Yeah, I really love corsets. I try to limit myself when purchasing them, but they’re just so pretty. At some point, I just need to start drafting and making my own.